The history of the Hall House is a blend of human achievement and architectural decline. Once known as the choicest dwelling in the village, and later the scene of happy events for college and town, it has become a rather forlorn casualty of careless maintenance. 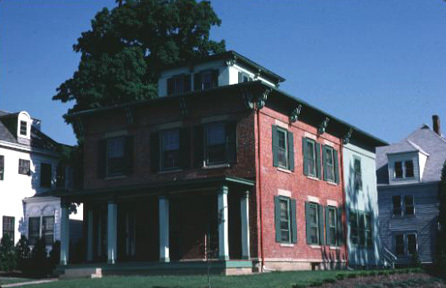 Built in 1853 by Anson Morris, a Connecticut-born master carpenter who worked on many of the college's early buildings, it was originally a square red brick mansion of symmetrical Italianate design. Fancy double brackets once graced the eaves of roof and cupola, and massive chimneys flanked the cupola on either side. An elegant flat-roofed, columned porch shaded the first-floor French windows across the entire southern face. In 1873 the house was bought by Rev. Heman B. Hall, an Oberlin graduate who had returned to educate his children. Hall's youngest son, Charles Martin, was a precocious lad who whiled away his hours at experiments around the house, once setting fire to the cupola. By the time he entered the college to study chemistry under Professor Frank Jewett, Charles had set up a laborartory in the family woodshed joined to the rear of the house. Here in the winter of 1886, encouraged by Jewett and assisted by sister Julia, he discovered the eletrolytic process for producing aluminum -- the basis of an industry and fortune from which the college prospered wonderfully after his death in 1914. Hall Auditorium and the college arboretum are the most visible local monuments to his generosity. In 1928 a plaque was applied to the house to commemorate Hall's feats. Meanwhile the "immortal woodshed" disappeared in an expansion of the house to the rear; the front porch gave way to an awkward substitute; the chimneys came down; and the brackets were stripped from the eaves. The interior was finally converted to faculty apartments. In 1980 the college removed the white spray paint it had earlier applied to the brick exterior, but further restoration remains stalled. Click here to return to the main page of "Historic Preservation in Oberlin".